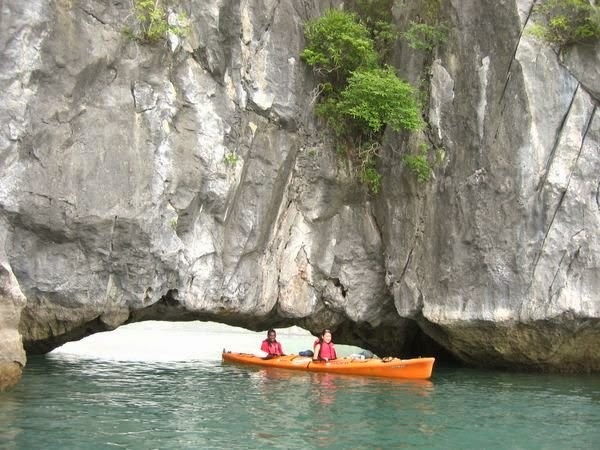 Today was to be a momentous day - the very first day to ever embark on an 'adventure' holiday - well, as adventurous as a 2 day kayaking Halong Bay on flat water can be considered. 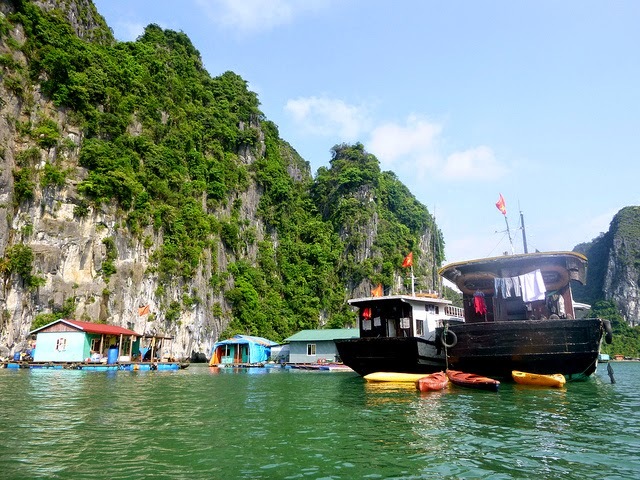 Yes, we were off to Halong Bay, Vietnam's most famous natural attraction, to explore underwater caves, hidden lagoons and secluded beaches, all while surrounded by spectacular water-submerged karst splendors. Karst, for those uneducated individual out there, since everybody knows what karst is, is a fancy name for big gray moutains of limestone that have lots of caverns, streams and sinkholes running through them. But first off, we had to enjoy a completely unscenic 4 hour drive to Haiphong, an industrial city that also served as the port to the Halong bay area. We then hopped onto a ferry that whizzed us across to Cat Ba Island. 5.5 hours on clock so far, and we disembark to discover that we still had to catch one more boat. But this boat was cool - a beautiful 50 seater wooden carved barge with a passenger list of 2 - just us. We started off drifting slowly amongst the huge karst islands. There is something magical about those islands - perhaps its the complete silence, and ambiance that is non existent back home. Each island had its distinct shape, which gave us hours of 'what animal does that look like' games. Many had large low overhanging cliffs, which meant we could glide underneath those rocks, pretending we were in underground caves. After an hour of paddling we came to our first stop - a floating fish farm. Out here, there are numerous of these - little floating piers about the size of 6 car park spaces, on which the farmers have built a house. They live out here, on their tiny little man-made island, rearing fish, together with their families. We saw little kids, and even dogs living on the floating farms. Next up we went to a 'secret lake'. Not quite as secret as it was meant to be though, since there were two other boats there when we arrived. What made this place secret is that you can only access it at low tide, when the water level drops below a mountain ridge revealing a very short little cave that lets you past. On the other side awaits a lake, secluded from the outside world by the surrounding monoliths. We then headed over to a little beach for some paddling and sun baking. The water here is reasonably clean, but smells and tastes fishy - I guess that's why they have so many fish farms around. So after a quick dip, we emerged from the water exuding odours akin to the local fish market. The next day we headed out in the kayaks for a second day of exploring. By now, we were kind of sick of Karst scenery, so our guide said he would take us underground caving. 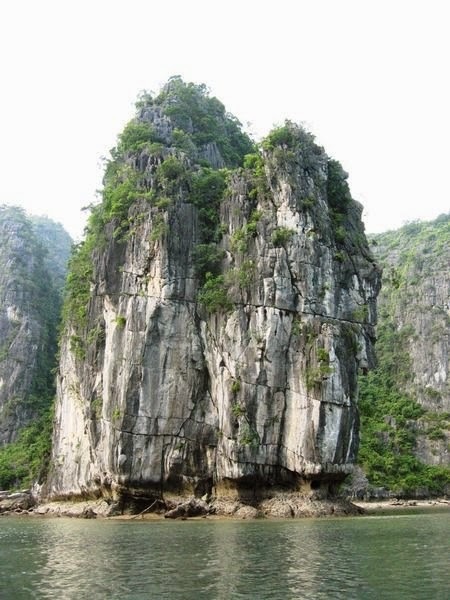 Alas, when we arrived at the cave, the tide was too high, and hence we were blocked from caving. But not to fear - the back up plan was just us fun - though a heck of a lot more tiring. Duc took us out into the open ocean - across big waves (I'd like to say 2 meter waves, but they probably weren't). Just when we were at the point of exhaustion, we pulled into a quiet little bay - the home of a private pristine little beach. Now this is the kind of adventuring we love - secret little spots at every corner!! This was a gorgeous little place, so we camped out here for a few hours, just enjoying the solitude and a blue blue waters. We did a bit more kayaking afterwards, seeing a few more sights, before heading back sadly for the trip back to Hanoi. Our boat back to the main island this time was not quiet as elaborate as the one we had arrived on. But a heck of a lot cooler. It was a little diesel tug boat made of random pieces of wood shoved together. We rode sitting on the back on some plank, with the engine puffing right below us. It was a fun experience - felt very 'back to grass roots'. So ended our Halong Bay tour. 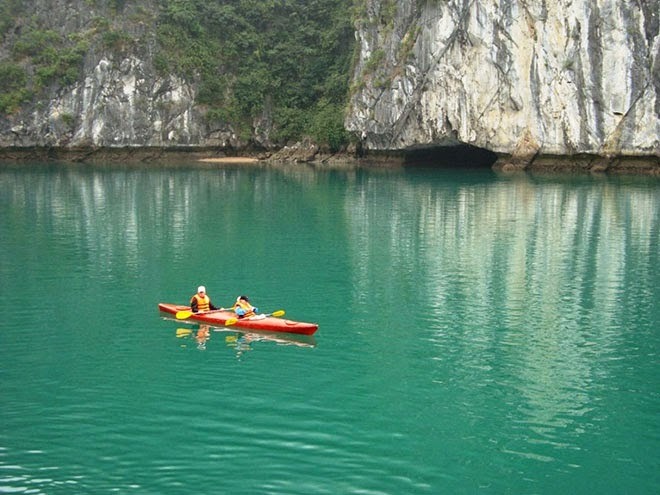 We're glad we decided to the do the kayak trek, because although the scenery of Halong is beautiful, its much more of a place to be 'experienced' that to be gawked at.